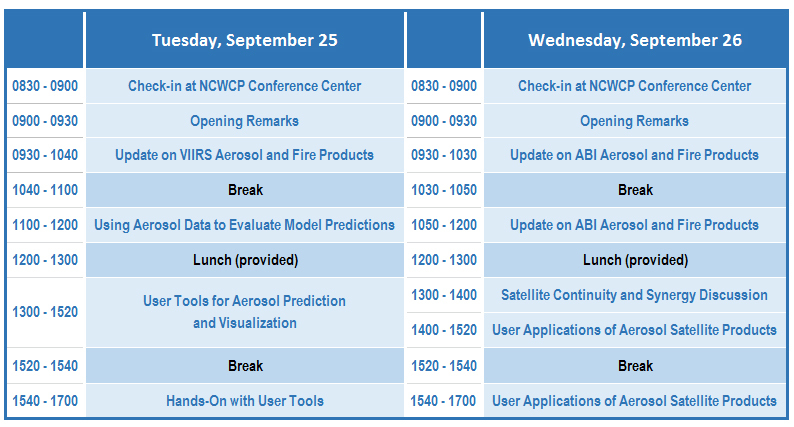 The NOAA Satellite Aerosol Product Workshop is a 2-day meeting that will highlight recent developments in the new generation GOES-R series/ABI and JPSS series/VIIRS aerosol and fire products. 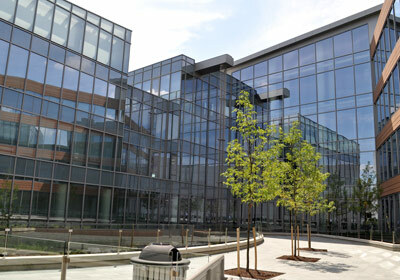 The workshop will bring together NOAA NESDIS product developers and members of the air quality satellite user community, including science and operational users. The status of ABI and VIIRS products will be presented, with a quick update on the current aerosol algorithms. A focus will be on presenting new VIIRS data from the NOAA-20 satellite, as well discussing as the situation with ABI data from GOES-17. Science and operational users will present their perspectives on using VIIRS and ABI products in their research and applied activities. New for the 2018 workshop will be a hands-on session with developers of a variety of aerosol-related tools, including models and derived products. Following presentations on each tool, users will have the opportunity to work with the tools directly and obtain hands-on guidance from the product developers. The workshop will also include several extended group discussions, on topics such as the synergy between geostationary and polar-orbiting satellite observations. 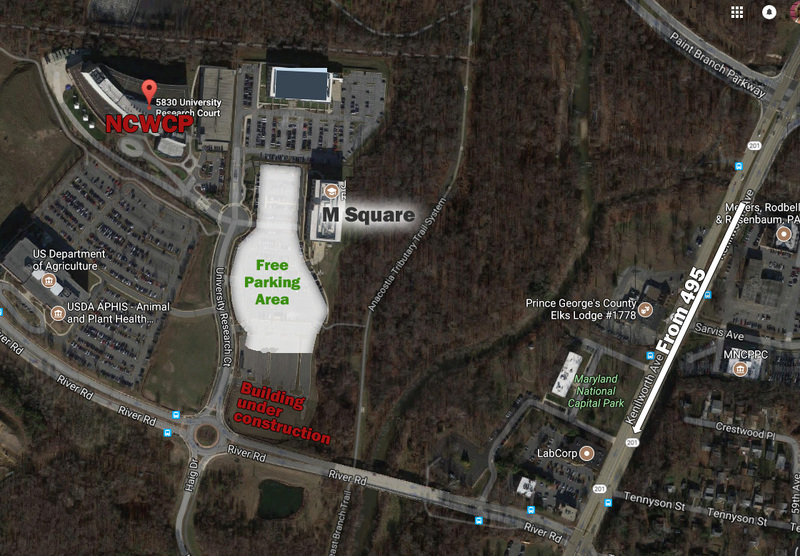 Map and directions to NCWCP. If you are driving to the workshop venue, once you turn onto University Research Court, park anywhere in the lot on the right (east side of University Research Ct.). Parking is free. Walk over to the NCWCP building, which is on the	left (west side) towards the end of the Court. In order to enter the building, you will need to show a driver's license or passport to the guard at the booth outside of the building. There is a block of rooms being held at the Crowne Plaza Hotel (formerly the Greenbelt Marriott hotel), 6400 Ivy Lane, Greenbelt, MD 20770, at a rate of $160/night until September 4. If you are staying at the Crowne Plaza hotel, there will be shuttle service to/from the workshop venue. The shuttle will leave the hotel at 8:30 AM and pick up from the workshop venue at 5:15 PM on both September 25 and 26. It is about a 15 minute drive from the hotel to the workshop venue. Workshop check-in will be Tuesday and Wednesday morning from 8:30-9:00 AM on September 25 and 26. We will have morning and afternoon coffee/snack breaks, and we are providing boxed lunches both days. Please bring a laptop to the workshop, if you have one. You will use the laptop for the hands-on session. Note that free wi-fi will be available in the NCWCP conference center during the course of the workshop. Remote attendees can participate via Webex. Shobha Kondragunta (shobha.kondragunta@noaa.gov) or Amy Huff (akh157@psu.edu) if you have any questions or comments.